The story of this one-act opera takes place at the eighth floor of the block of flats at any prefabricated jungle. A married couple is going to celebrate the tenth wedding anniversary. Not that they would like to enjoy romantic moments but because the unbearable wife´s mother pushes them to celebrate it. She visits them on Sunday without any invitation. The husband and his wife are not a perfect example of a happy couple. The mother is well aware of it. Emotions in the kitchen escalate as the lunch is cooked. The kitchen gets to turbulences after the mother has entered. Mother has her own key how to make this meeting an “unforgettable” party and opens the Pandora´s box of the life of the married couple. And two small children are all the time locked in the adjacent room. Who knows why…? A comedy for a narrator, a male voice and a female voice about looking for the truth between the floors, between a husband and his wife acting in and between pots and tableware accompanied by the electronic music, a drummer and DJ-ing. Marek Kundlák: Currently working as a Project Manager at ´Opera of Slovak National Theatre´ (since 2009). Marek has graduated from Conservatory of Bratislava (acting and music) and University of Music and Performing Arts in Bratislava (theatre dramaturgy). He is the cofounder of a physical theatre group ´The Third Hand Theatre Company´, (est. in Edinburgh, Scotland in 2007, currently based in Slovakia), where his works include writing, dramaturgy, co-directing and music composing (´Woyzeck´ (Edinburgh Fringe 2007) ´Black Box Lost´ (Edinburgh Fringe 2008), ´White Box´ (Kreater Festival, Slovakia 2011), ´Red Box´ (Kreater Festival, Slovakia 2012), ´This Is Not a Golden Fish´ (Banská Štiavnica 2013)). He has performed in a number of Slovak theatres, incl. Arena, Astorka, Bratislava Puppet Theatre, Non Garde, and the Slovak National Theatre. 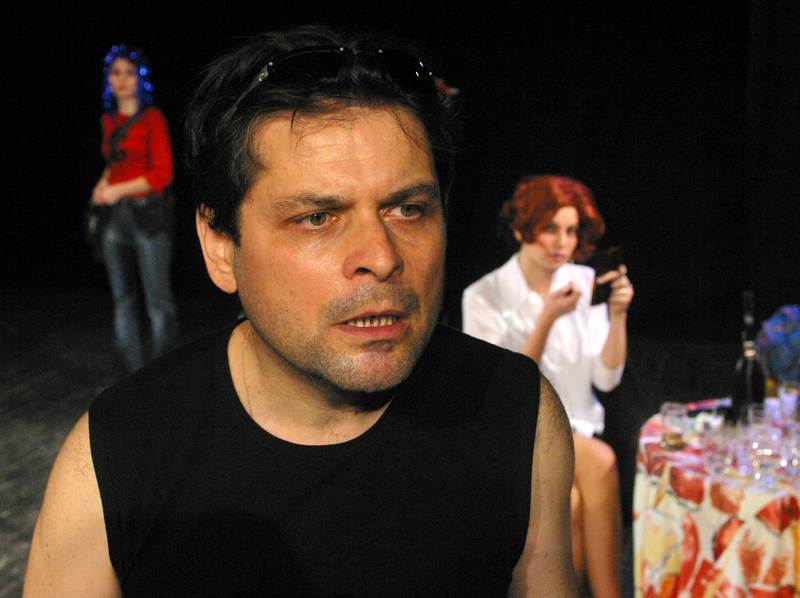 Marek is also an author of poetry, drama and librettos for theatre, radio and festivals (video opera ´A Tooth For a Tooth´, opera ´My Sea Gaddáfí´, oratorio ´Passion of Stefan H.´, mass ´Requiem For a Mafia Man´) and song lyrics for his music and a vast number of different co-productions. Marek is a singer, musician and composer, spreading his interests in different musical fields from classical music to contemporary experimental music. He composes for theatre, dance theatre, film, as well as his ´DIY Instruments Ensemble´ – an orchestra of self-made instruments. He´s a member of Composition Laboratory based at University of Music and Dramatic Arts and cooperates with the Experimental Studio of Academy of Music and Performing Arts. Marek has also worked as an Assistant Director in Opera SNT with directors from across the Europe (Gintaras Varnas, Jiří Prudek, Nicola Raab), gaining more experience in blending music with theatre in big-stage productions, as well as a Project and Tour Manager of Opera SNT on tours at international festivals (´Pafos Afrodite Festival Cyprus 2010´, ´Pafos Afrodite Festival Cyprus 2012´, ´ARMEL Festival, Hungary 2012´). Laco Kerata was born on 1 January 1961 in Novaky, Slovakia. He is a graduate of the Academy of Music and Performing Arts (theatre direction). In 1991, together with Blaho Uhlar and Milos Karasek established “Stoka Theatre” (Divadlo Stoka) and worked there until 2002. Later he founded a theatre association “Med”. He has performed with the music group Sisa´s Food. Laco Kerata has written more than 15 theatre and radio plays. The titles of his collections of poetry are “Sinful Dreams” (Hriešny spánok) and “I came, I saw” (Prišiel som, videl som). He wrote dramas “Radio Games” (Rádiové hry) and “Dinner above the Town” (Večera nad mestom), a short stories collection “Not too Bad” (Mám sa). His novel “A Miserable Actor” (Zlý herec) advanced to the finals of the “Anasoft Litera Award” and was published also in the Czech language. In 2013 he published a short stories collection “Back Passes” (Malé domov). He lives in Bratislava and works as a director in Radio and Television Slovakia.